Legally operating a snow mobile is one of those situations when the requirements really, really depend on where you live. Obtain a special driver license or endorsement. 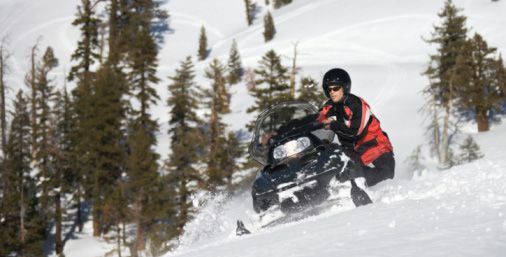 Complete a snowmobile safety course. Some states require a special drivers license to operate a snowmobile; others leave the decision up to the town, city, or county. For example, Nebraska requires a special license (it’s more like a permit). There’s no fee and you only have to pass an eye exam. On the other hand, New Hampshire lets each municipality set its own snowmobile regulations. Some states, like Michigan, require no special driver license to operate any type of off-road vehicle. Of course, for these states you’ll want to check about age and education requirements before you set your 12-year-old off on his first big adventure. Some areas require drivers of a certain age to obtain training before they can operate snowmobiles. For example, Minnesota residents who are born after December 31, 1976 must obtain a snowmobile safety certificate before they can operate snowmobiles. Yes, this means taking a safety course, just like most teens have to do when they start the process to get their regular drivers license. Don’t Forget the Title and Registration! Depending on your state, you might need to register your snowmobile – which means you’ll also need the title, bill of sale, and other registration-related documents and fees. Typically, registration provides you with some sort of decal to place on your snow mobile. This shows law enforcement, parks and recreation officers, and wildlife officials that your snowmobile is legal. Do you own or ride a snowmobile? What are the driver license, age, and education requirements in your state or municipality?